Sgt. 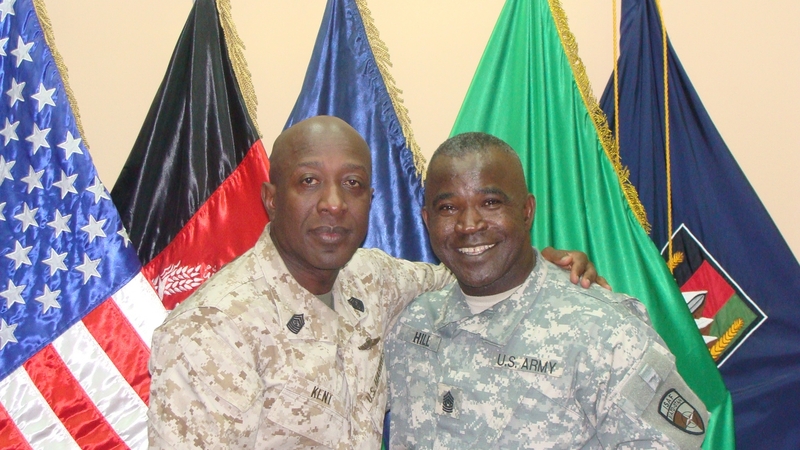 Maj. Carlton Kent, left, and Sgt. Maj. Marvin Hill. KABUL, Afghanistan — Army Command Sgt. Maj. Marvin Hill is not a household name among Marines, but his career has skyrocketed parallel to that of his long-time friend, Sgt. Maj. Carlton Kent, who stepped down June 9 as sergeant major of the Marine Corps. “I went to high school with Sgt. Maj. Kent, he’s a homeboy and a very close friend,” Hill said June 3 in his office at NATO headquarters, where he is the senior enlisted leader for International Security Assistance Force and U.S. Forces Afghanistan. Translation: He is ISAF commander Army Gen. David Petraeus’ wingman, and has been for most of the past decade, making it to the highest echelons of the Army alongside one of the most prominent generals in a generation. His friendship with Kent, Hill said, began in their hometown of Memphis, Tenn., where Hill enlisted in the Marine Corps in 1978, two years after Kent. Over the past 15 years or so, as they moved up in their careers, Hill said, the two Memphians stayed in touch to share experiences, ideas, frustrations and lessons. “He would call me nearly every week while I was serving as the command sergeant major for Multinational Force-Iraq. I could almost set my watch by it,” Hill said. Now Hill is about to work for a Marine commander. As Petraeus gets ready to retire from military service and become head of the Central Intelligence Agency, Hill has agreed to stay on the job for another year to work with incoming ISAF commander and first Marine to hold the top job in Afghanistan, Lt. Gen. John Allen. “He asked me if I would stay and I told him absolutely, because it’s for the team and it helps with continuity,” said Hill, who turned down an opportunity to be a candidate for sergeant major of the Army to stay on in Afghanistan. Hill and Allen are not strangers. They met in 2008 when Petraeus was commander of Central Command and Allen came on as deputy commander. Their wives are close friends. This man is a great man to me. As a mom of a soldier, I wrote to him about some concerns I had, and after a little time he wrote back. To be receptive to a private citizen means he surely will be there for the soldiers under his command. Mom’s can be a pain in the buttocks about their children; at least I am, and for him to offer to help me or even just listen to me, is something I will never forget. Thank you, Sargent Major Marvin Hill. I will never forget your kindness to me, when I get so concerned about my kid in Afghanistan. I salute you and all you do for the soldiers of the United States of America. You made some respectable factors there. I appeared on the web for the problem and found most people will associate with with your website.